D-300 before starting to dream in colours again. 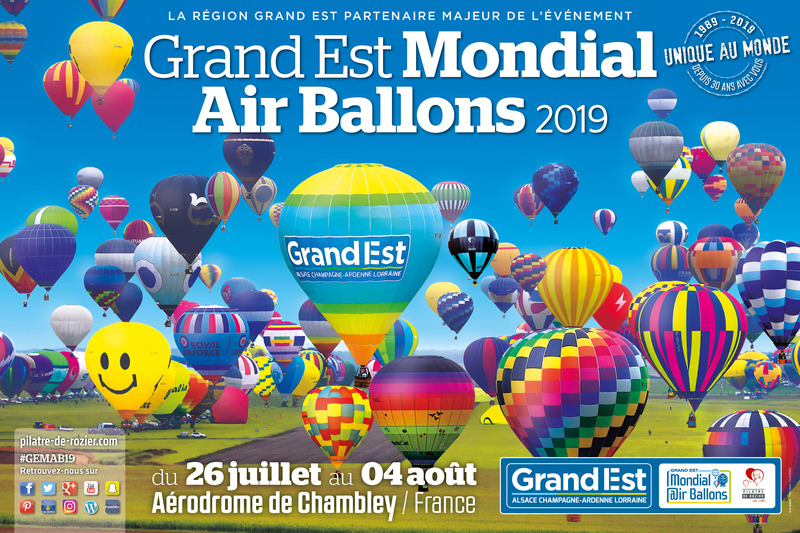 Grand Est Mondial Air Ballons®, created in 1989 to celebrate the bicentennial of the French Revolution, will be back from July 26 to August 04, 2019. An anniversary year that will celebrate the event’s 30 years. During 10 days, early mornings and late afternoons, everyone’s eyes will be raised towards the sky to admire hundred of multicolores bubbles that go up to the sky. And who says new edition says novelties. New name, new logo, new slogan and new visual! Today we reveal some of them… A part of the visual, to present you our new logo. For its 30 years, the logo takes the colors of our beautiful Grand Est region, that proudly conveys the event. The 16th edition which is already actively preparing behind the scenes promises a lot of surprises. Entrance and parking still offer to visitors, there will be more hot-air balloons and more terrestrial animations to immerse you inside the world of aerial sports between the two daily flights. Golden hours of Grand Est Mondial Air Ballons® will be honored. The magic, the adventure and the balloon passion will be spread by more than one thousand balloons pilots from all around, from five continents. Located at the heart of one of the six regional parks of Grand Est region, the magnificent Lorraine Regional Natural Park, welcome the event on an ex-NATO airbase, convert by the Region in an aeronautical, automobile and touristic centre. A destination of choice, almost at the heart of the new Grand Est region that extends from Strasbourg to Troyes and gathers more than 5.5 million of inhabitants. A strongly European territory that borders Belgium, Germany, Switzerland and Luxembourg. The event highly contributes to regional economy thanks to its touristic and newsworthy attractiveness. Meeting is given, during summer 2019 you have “#GEMAB19” on Chambley aerodrome!